From the small Volvo MC60 to the larger MC135 Skid Steer, every machine in Volvos line up tops its class in performance, comfort and safety. When working with a Skid Steer, Tires are typically one of the first major things that need to be replaced. When you buy your Volvo Skid Steer Tires from Monster Tires, you work with the most trusted tire distributor in the industry who offers top of the line customer service and the best prices in the industry. Contact Monster Tires today to order a set of Volvo Skid Steer Tires and see what else we have to offer. Here at Monster Tires, we want you to get the best quality tire available without having to break the bank. That is why we offer such fantastic deals on Volvo Skid Steer Tires, including MC110 – MC135 Skid Steer Tires and MC60 – MC95 Skid Steer Tires. Whether you are looking for a Front Tire Set for Volvo Skid Steer, a Rear Tire Set for Volvo Skid Steer, or a full Tire Package for Volvo Skid Steer Tires, Monster Tires has the deals and the selection you need! High Quality Volvo Skid Steer Tires. Your Volvo Skid Steer depends on having high quality construction tires to be able to get the job done. Good tread on your tires means you can navigate your Volvo Skid Steer into more difficult areas and on difficult terrain to be able to do your work. It keeps your worksite safe and it saves you from having to pay fines. At Monster Tires, we specialize in Heavy Equipment Tires to get your piece of equipment rolling again. 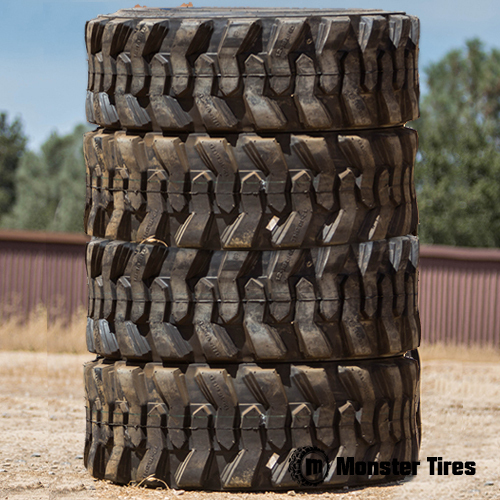 Trust in Monster Tires for your next set of Volvo Skid Steer tires!